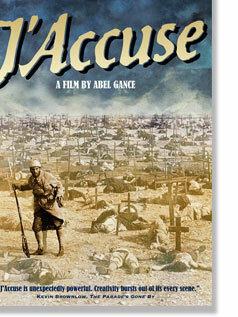 Abel Gance’s J’Accuse on DVD! If your attention was caught by the recent release of La Roue on DVD, then you’ll definitely want to also pick up a copy of J’Accuse (1919), another silent epic by Abel Gance. It promises to be as fulfilling as his other movies, this time concerned with the First World War. It will most certainly be interesting as a contemporary reaction to the war as well as yet another exhilarating silent. Flicker Alley DVD are really proving themselves with their release record. In particular check out this monumental tribute to the great magician of the silent cinema, Georges Méliès. You can find it at the Flicker Alley website http://www.flickeralley.com/fa_jaccuse.html or at Amazon. It won’t be available until September though.